figure out a better seedling “hotbox” – buy seed mats? The plants under row cover in the hoop house have stopped growing, but they are all alive and well, just waiting it out. I am planning to get some fresh horse manure from my neighbor and creating a small “hotbed” in the hoop house for some early spinach. It would be interesting to compare the growth of those plants to the ones under the row cover, and to what extent the decomposing horse manure heats up the hoop house. I am out there twice a day to clear the snow off and away from the hoop house so light can penetrate and the structure isn’t too stressed. 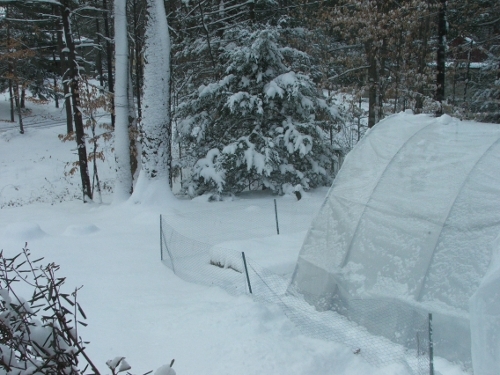 I am happy to report that the hoop house has withstood heaps of snow and gusts of wind, so our reinforcement of the top connectors seems to be working. I managed to finish both volumes of Edible Forest Gardens when I was in Belgium and my first project will be to thoroughly re-assess our property. Digging holes and staking out areas will have to wait until the two-foot-thick blanket of snow has gone, but I will have to eyeball some of it and decide on some bushes and small trees. It’s great to see the juncos play in the fluffy snow and vie for a place at the feeder with the cardinals and the passerines. Glad you’re both back safely! Co-incidentally, Hobby Farms magazine had an article on making a manure-heated cold frame in their last issue. We don’t get cold enough to bother, but you might be interested.